Being the new kid on the block is tough. It's natural that renters may be a little more hesitant to get to know you. With multifamily construction spending hitting a new record high in December 2018, increasing lease-ups with this growing competition is a major challenge for multifamily developments. Strategizing creative marketing ideas for your apartment is a good place to start, but the development stage is where you can make the most impact when it matters most. Establishing relationships, staying top of mind and building trust are the other pieces you must tap into during the lease-up phase. Below are our top 8 apartment lease-up ideas designed to increase occupancy. First and foremost, your community needs a brand. Building your community’s brand is no easy task, though. Before you can dive into securing your lease-ups, focus on what makes your community such a great place. Is it a new way of living in a downtown area? Or a suburban escape from a busy life? Your identity is the center of your community. Be sure to introduce your development locally and keep messaging consistent so that prospects recognize you doing their research. Prospects looking for apartments in your area are bound to explore any number of apartment listing sites or go straight to Google. According to Apartments.com, 61% of users searching for apartments begin with an apartment listing site or search engine. Make sure your rental listings and web pages are in top shape with keywords that help you stand out in search results. Don’t forget to optimize your Google listing as this element is key to your SEO efforts as well. Also consider exploring long-tail keywords. Packing your content with long-tail keywords provides a more relevant search result. For example, if you’re an apartment in the D.C. area, but is also pet-friendly, has a dog wash, and a dog run -- add a pet-friendly web page to your website with keywords like “two-bedroom pet-friendly apartment in D.C. with dog run” or “pet-friendly apartment in D.C. with dog wash.” This easily narrows down the prospect’s search and your community will appear much quicker in their results. The multifamily and senior living industries are in what we call an “amenities war.” After all, building amenities have a 62% influence on a prospect's decision to rent. Millennials make up the majority of today’s renters, which means that they’re looking for smart amenities and meaningful experiences that will make their life at your community great. During the lease-up phase, your marketing efforts should give prospects a clear look at your amenities. From club houses to conference rooms to package delivery lockers, your prospects want to see what makes your community better than the one across the street. If you have any smart amenities that integrate with a smart home device, consider doing a raffle giveaway of a Google Home or Alexa for each application or tour you receive. Showcase your community amenities with 3D content or virtual tours to include across all your listings and website. Work with local business to print and hand out flyers with purchases. Promote your new community with 3D animation fly-through videos to share on social. If your community will have energy-saving technology, promote money savings. While you can supercharge your website with great content and pack keywords into your rental listings, the biggest hurdle for your development are photos. How are you to show off your community when it’s still a construction zone? Photography is clearly out of the question, but thanks to 3D rendering services, you can market your amenities, grounds and model units. 3D Renderings have become so advanced that spotting the difference between a 3D rendered image and an actual photograph requires scrutinizing eyes. With photo-realistic 3D images of your community, you can upgrade your listings during development to increase lease-ups. Because you’re limited to 3D content during lease-ups, it’s essential to find other innovative ways to market your units. Don’t underestimate the power of top view floor plans, which give your prospects a clear look at their future home. If you aren’t leveraging 3D floor plans, you could be missing out on securing more apartment lease-ups with a truly unique marketing tool. 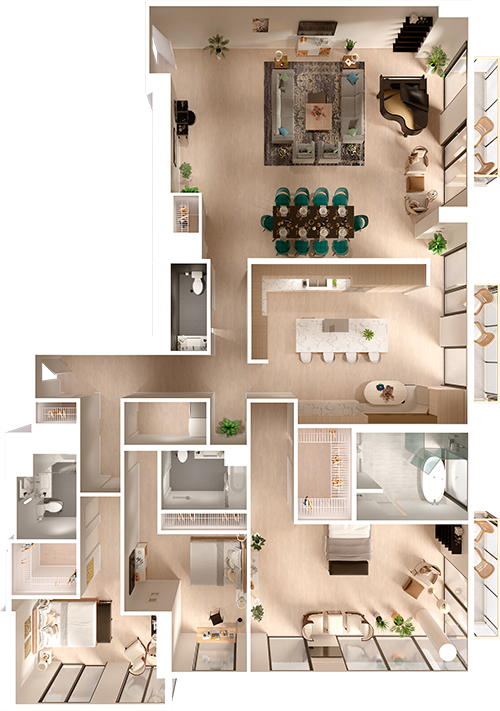 3D Floor plans have a stronger approach than 2D top view floor plans, as you’re able to display textures, wall colors, patterns, flooring, accessories and furniture. Here is an example of a 3D rendered penthouse. Floor plans like this give that “dollhouse” effect to prospects. They can see the entire full scale of their future home and the room flow. In addition to floor plans, a unique sales tool is an interactive site plan. What is an interactive site plan? It’s a scaled building model with the ability to select any floor and view floor layout and model units with floor plans. This is a unique real-time availability tool that lets your prospects drive their own experience when searching for a model unit. Prospects can view floor plans in a multi-level experience, select a model unit of their choice and immediately apply or request more information. Explore the Alta Roosevelt in Chicago, which is utilizing an interactive site plan to increase lease-ups. The most challenging aspect to the lease-up phase is the length of the sales cycle. Prospects are hesitant to sign a lease sight unseen because they’re not able to do the one thing that helps them decide on your community: take a tour. A 3D virtual tour, however, addresses this problem by letting prospects take a tour from any device and from any location, whether that’s a smartphone, tablet or laptop. You can embed the virtual tour directly on the apartment’s website and upload to your Google listing. 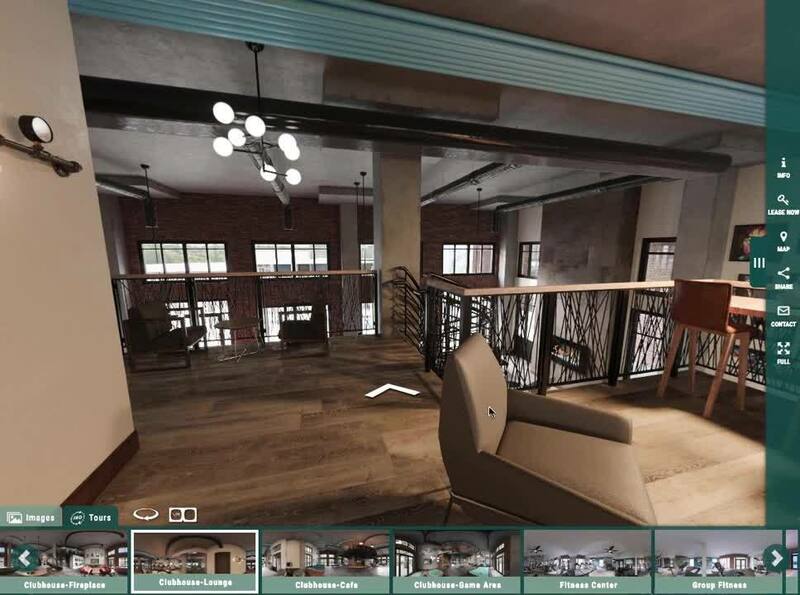 3D Artists can create photo-realistic renderings into full 360 walk-throughs so that prospects have a meaningful experience with your community -- even before it’s built. Virtual tour stats tell us that two-thirds of people want more virtual tours and real estate listings with a virtual home tour get 87% more views. Tours can also be shared via email or social media, and your leasing agents have the option to give guided tours via a meeting tool. Not only does this increase the chances for more lease-ups, your leasing agents can establish a relationship with prospects over the phone while giving guided 3D tour of your community. Lastly, while you may have leasing agents focusing on virtual tours, chatbots can give your website experience an edge with quick and easy information for visitors. The average length of time individuals converse with a chatbot is 2+ minutes, which directly helps your SEO efforts and website dwell time. What’s more, multifamily website conversion rates often hover around 1-2%, but chatbots are converting prospects 600-1800% better. According to 30lines.com, prospects are staying on apartment websites to chat with chatbots and learn more about a community. This a valuable opportunity to not only share as much information as possible with your leads, but also secure virtual tour meetings with leasing agents. Additionally, chatbots are available 24/7, so you’re capturing those leads at all hours of the day. Bonus Tip: When your apartment development has finally reached an end and you’re ready to open your doors, refresh your Google Street View so that your new building is visible on Street View, Google Maps and your Google listing. From website optimization to interactive experiences, staying on top of multifamily trends is essential to secure more lease-ups. In today’s market, renters want meaningful experiences that are convenient and informative. Thanks to advanced multifamily and senior living tech trends, achieving that kind of marketing approach is much more achievable. If you’re not taking advantage of these tech trends to stand out, consider adding more unique experiences to your marketing strategy for a boost in apartment lease-ups.